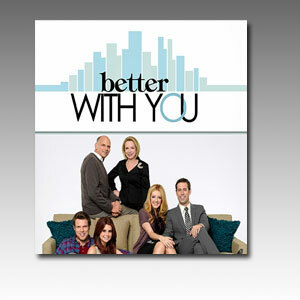 Better with You Season 1:The series revolved around three different relationships that are tightly intertwined in one family, as it follows a couple, Maddie and Ben, who had been dating for nine years and are happy just living together despite not taking the next step, marriage. Maddie's life is thrown for a loop when her younger sister Mia announces that she is pregnant and is about to marry Casey, a guy whom she has only known for seven weeks. To make matters worse, Maddie is stunned that their parents, who have been married for 35 years and have their issues, approve of the union, leaving Maddie and Ben questioning themselves about their own relationship.Enjoy Better with You Season 1 DVD Box Set here.